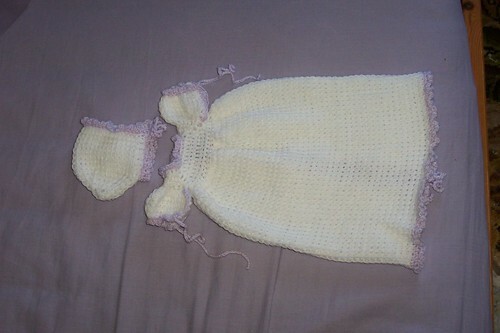 Tunisian Crochet Tiny Angel Gown « T-Bird\’s crafty Blog! using 4 ply yarn in white and a small amount of a contrast colour (that’s UK 4 ply) 3mm crochet hook (larger if your stitches are not soft and drapey) and a Tunisian hook size 8mm (I think, it’s not marked up but that’s what it feels closest to compared with my other hooks) You don’t absolutely need to use a Tunisian hook but the stitches will be very squashed on a normal one. that’s the fiddly row done now, the rest is more straightforward honestly! Work 4 rows in basic Tunisian stitch then break yarn. you don’t need to do any “cast off” row, that comes next. Do not sew up the sleeve seams, they are left open to allow easy dressing. Using contrast yarn and the 3mm hook, start at the beginning of the sleeve edge (where it joins the bodice) and slip stitch up one side of the work to the last sleeve row, work a gather across the “cuff” by catching 2 front posts with each slip stitch across the cuff then continue down the other side of the sleeve. Rejoin white yarn at the back of the bodice, with right side facing you, work in htr to sleeve, ch2, fold bodice and sleeve then continue to work stitches across the front of the gown, ch 2 under second sleeve and work to end. Work for 12″ and break yarn. Starting at the back of the neck, work round entire garment in slip stitch using contrast colour, working through the front post of the last row of your skirt. Work back in ch3, slip stitch as for sleeves or other decorative stitch if you prefer. Thread ribbon or crocheted chains through the sleeves just before the cuffs to allow the sleeves to be closed once the gown is on. Sew ribbons or crochet chains back of the gown at the neck, waist and 1 or 2 places down the skirt. row 6, use 3mm hook to pick up loops instead of Tunisian hook, draw thread through all loops on hook in 1 sweep, pull snug and fasten off leaving a long tail. Use tail to sew up back of bonnet to first decrease row. Trim with contrast yarn as for gown pattern and sew on crochet chains or ribbons at the front to fasten. This entry was written by tbird and posted on 19 May , 2007 at 8:39 pm and filed under SCBU items. Bookmark the permalink. Follow any comments here with the RSS feed for this post. Post a comment or leave a trackback: Trackback URL. I love your Angel Gown. It is just too sad to think of babies being born that little. I have been wanting to make some of these gowns, but haven’t tried it yet. I have heard of tunisan hooks, but haven’t look at the store to see what they look like. Thanks for sharing this beautiful gown and pattern. Thanks Cindy. they don’t take long to make, they are just so tiny, but they mean a lot to the families who they are given to. Tunisian (or Afghan) hooks are not so easy to get hold of, however I think Annie’s Attic sell them. Mine is a hand me down from my mother in law.